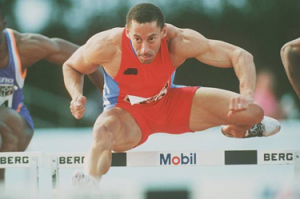 Mark McKoy won a Gold medal for Canada in the 110m hurdles at the 1992 Olympics in Barcelona and won the bronze medal in the 60m hurdles at the 1991 World Indoor Championships, and a gold at the 1993 World Indoor Championships. Additionally, Mark won the gold medal 1982 Commonwealth Games in the 110m hurdles and Silver as a member of the 4x100m relay. At the 1986 Commonwealth Games he repeated as Gold medalist in the hurdles and earned gold in the 4x100m relay. Mark attended his first Olympics in 1988, and placed 7th in the hurdles.